The southernmost peninsula of Mumbai, known as Colaba, is where most travellers gravitate. It has a good range of hotels and restaurants and houses two of the city's most famous landmarks: the Gateway to India and the Taj Mahal Hotel. 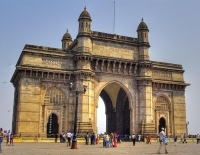 The Gateway to India was built in 1911 to commemorate the visit to India of King George V and Queen Mary. The archway is built from honey-coloured basalt in a style derived from Gujarati architecture of the 16th century. In the days of the steam liner, the Gateway was for many visitors their first and last sight of India, but today it acts purely as a colourful tourist stop, and attracts hawkers, snake charmers, and beggars. The neighbouring Taj Mahal Hotel was built in 1902 by JN Tata, after he was allegedly refused entry to one of the city's European hotels on account of being 'a native'. It has since turned into a bit of an institution, and the streets behind it have become a Mecca for foreign shoppers; the Colaba Causeway is the main street, with a melee of street vendors, shops, stalls and cafes. Unfortunately Colaba was also the site of two of the 2008 Mumbai Attacks and tourists are recommended to remain vigilant when visiting the area. To the north of the causeway, set in beautiful lush gardens, is the fascinating Prince of Wales Museum displaying a collection of ancient and medieval sculpture and Indian decorative arts. Nearby, the new National Gallery of Modern Art showcases Indian modern art. To the south is the Sassoon Dock, which at dawn becomes an area of intense and pungent activity as fishing boats arrive to unload their catch.